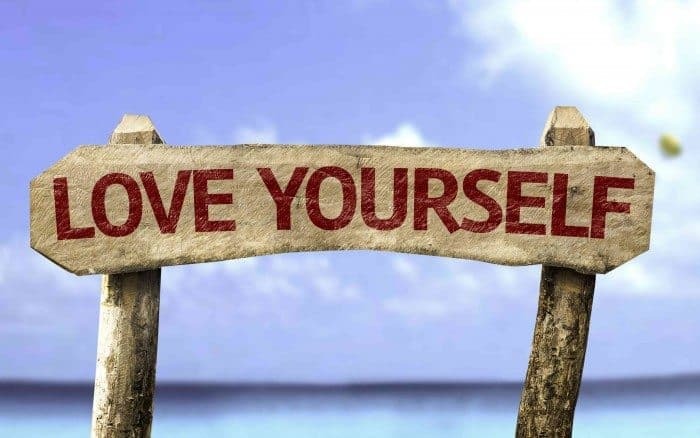 When we love ourselves, we can more easily navigate the ups and downs of life. Self-love forms a supportive foundation that bolsters us through our days. We always have that love, whatever situation we might be experiencing. We may have many friends and lovers throughout our lives, but the only true constant is the love we give ourselves. But thinking about loving yourself and actually doing it are two different things. It can take time and focus to cultivate unshakeable self-love. Here are a few tips to help you awaken this most important super power. Watch what you say to yourself. Replace words of self-criticism and judgment with compassion and care. Learn to accept your foibles and idiosyncrasies, your wins and your losses. Self-acceptance is the doorway to love. Cruelty and self-hatred become downward spirals that make you miss the beauty and joy of life. Self-acceptance, including positive self-talk, is crucial for a happy life. Notice what you say to yourself when you first wake in the morning, when you look in the mirror, and when you make your breakfast. When you complete a task do you take a moment to acknowledge your achievement? When you make a mistake do you accept it with grace or beat yourself up? Try working with positive affirmations to raise your frequency and inspire a supportive self-assessment. When you make a mistake, accept your humanity even as you recommit to doing your best. We all need to time alone to discover ourselves. Give yourself at least five minutes of “me time” each day. You could meditate, go for a walk and smell some flowers, or stare at a blank wall, it does not really matter. Just take a little time to listen to your feelings, wishes, and needs. Bonus points if you can listen to yourself with compassionate, judgment-free, mindful awareness. Movement is a key aspect of physical and mental health. Moving your body literally moves energy. And movement is most effective for cultivating self-love when you are doing something you actually enjoy. It could be dancing, kayaking, hiking, snowshoeing, or whatever makes you smile and sweat. Food is one of the simplest and most powerful things we can give to ourselves. For it to be an act of self-love, the food must truly nourish your body and soul. Some days that may be a raw vegan salad full of fresh veggies. At other moments true nourishment may look like a scoop of vegan ice cream. What matters is that you are feeding yourself on the deepest level possible. Self-love includes taking care of yourself like you would a loved one. Get plenty of sleep, learn the power of hot baths, find work you enjoy, and remember to play. Taking care of yourself should not be the last thing on your to-do list, but rather the first. We can only give when we are full. This also means going easy on yourself when you do not live up to your expectations. If you make a mistake, get ill, react defensively, or do something else that bothers you, learn to accept it as part of who you are in this moment. Healthy friendships are one of the most important aspects of life, but it is challenging to maintain a healthy friendship if you never connect. So often in our busy modern age we communicate with people only when we have a need or obligation. But part of opening to love is learning to give mindful attention to yourself and others, simply for the sake of connecting. Call your friends just to let them know how much you love them, without any agenda or logical purpose. That act of selfless appreciation will bolster your self-love, as well. Want to create a new art project or launch a business? Get started. Love someone? Tell that person, even if you are afraid of rejection. Whatever secret wish lives in your heart, bring it out into the light and give it a chance to come true. At the end of their lives, what most people regret are the things they did not do, the dreams unlived and the words unsaid. Love yourself more by doing what you really want to do, right now. Some spiritual traditions say that the greatest gift we can give to the world is our love. When we love ourselves, we increase the amount of love that exists everywhere we go. This love creates a palpable energy that can heal and inspire people, simply with our presence. Find ways to love yourself more each day, and watch how your life evolves.